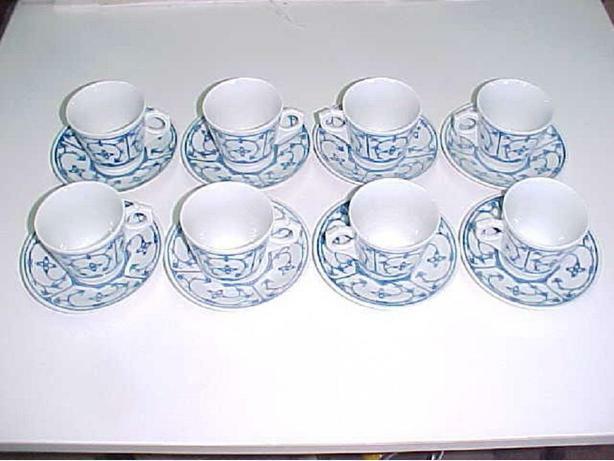 THE SAUCERS MEASUR 5 INCHES IN DIAMETER AND THE CUPS STAND 2 ¾ INCHES TALL. THEY ARE DECORATED WITH ATTRACTIVE ABSTRACT FLORALS AND CIRCLES IN COBALT BLUE ON WHITE. THE SET IS IN EXCELLENT CONDITION WITH NO CHIPS, CRACKS OR CRAZING. FOR OTHER ANTIQUES, VINTAGE COLLECTABLES AND ITEMS OF INTEREST PLEASE VISIT MY OTHER ADS.